Dogs are constantly bothered by fleas and ticks. 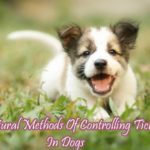 On top of that, it is also difficult to spot whether your dog has ticks or not, as those pests tend to hide deep in the fur of the pet. Thorough regular examination for fleas and ticks is necessary. If infested, you have to take the necessary and proper steps to remove these harmful pests from your dog. You have to apply the safest repellent to protect your dogs from fleas and ticks. Do not apply repellents that might cause irritation to your dogs. Our methods will be helpful to you in providing the information about the non-toxic flea and tick repellent for dogs. Many pet owners fear the potential unwanted side effect of chemical tick repellents. 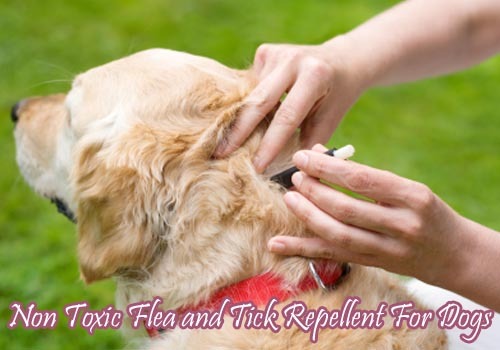 An all natural spot-on repellent for dogs is a sensible choice if you don’t want to use strong chemicals. Such alternative repellents combine a number of natural essential oils that are harmless to dogs but have a repelling effect on bloodsucking bugs. A flea collar for your dog is great because it contains a repellent that works great with all types of insects including ticks. In fact, this is one of the best ways to ward off ticks using a steady technique. To prepare the collar remedy, you need to dilute three drops of cedar and lavender in three tablespoons of water. Place your collar into the mixture and then tie it on your dog’s neck. Use lemon or orange to extract the citrus oil that is a great repellent. This means that you should boil the peels form oranges and lemon and let it cool down naturally. Avoid aiding in the cool down process. Use the mixture to apply to the affected areas on the dog. Alternatively, you can use repellent using drops of orange juice in some water and bring it to boil. In the mixture add at least five drops of lemongrass oil. You then have to shake the mixture properly before allowing it to cool then apply it on the affected areas. Rose geranium oil is one of the most effective ticks repellent that can work wonders for your pet. You need three drops of rose geranium oil mixed with three tablespoons of almond oil. This mixture is then mixed properly and applied to the pet’s fur. Your target should be around the pet’s fur. It is important however to note that this remedy only works well for dogs only. A Combs is a simple and cheap solution for removing ticks and fleas. You should make it a habit to always comb your dog every time you return from your morning walk. This will always mean that your dog is well groomed leaving no room for ticks to hide in the fur. You can always note when there is a tick infestation that needs to be addressed. In fact, this method always combs off any ticks that could be stuck on the pet’s fur. They all help ease the irritation brought about by these stubborn pests. 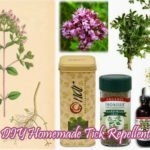 The good thing is that you can always find a repellent that does not involve spending so much money on harmful chemicals. Diatomaceous earth is also known as diatomite or kieselguhr. Diatomite is the silicate skeletons of fossilized shells that used to inhabit the ancient oceans. It is harmless for external use for all non-insects, domestic animals, and humans. When rubbed into the pet’s fur it kills skin parasites by destroying the bugs epicuticle, which will result in dehydration, causing the parasites to die within 24 to 72 hours. 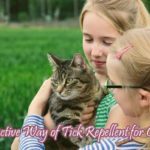 Some tick repelling sprays can be made at home using natural ingredients such as essential oils. 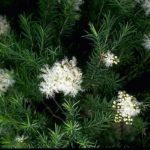 The essential oils from eucalyptus, rosemary, lemongrass, lavender, etc are used to control the spreading of fleas and ticks on your dogs.